You may have had a feeling of déjà vu as we read this morning’s Scripture lesson. And you would be right. Only a month ago we were reading this story of John by the Jordan in the third week of Advent. And because we were in Gaudete Sunday (the Sunday of Joy) and because the lectionary committee were not yet ready to have Jesus come on the scene—I preached on John, and his prophecy that the One after him would baptize with fire and Spirit. Today, we remember what John said, but add the enfleshing of his words to it as well—as we see Jesus come on scene, not trumpeting his existence, but coming to be baptized in the Jordan as so many others were doing. And given the beautiful anthem we just sang, I could have focused us on the waters, the waters of baptism, the waters of cleansing, the waters that often show up in biblical visions (not strange for cultures that often lived in desert conditions). You can hear the “but” coming, right? Sometimes, something strikes you about a text, and then, well, then for me, and for you, we follow it. And what stuck me this week was those images of fire and dove. And it struck me because I was surprised at thinking about Jesus’ baptism in a different way than I had ever thought about it before. And as an officiant of baptisms, I know that it is a holy place, a holy space. But never again will I perform a baptism without consciously thinking—we are standing on holy ground. That is not something that we Presbyterians, or even we main line Protestants, or even we Western Christians, do very often—remove our shoes, to recognize that we are standing on holy ground. In fact, the one day of the year that we might have held onto removing our shoes, Maundy Thursday, when Jesus bent to wash the feet of his disciples, is usually only done in pantomime, or with one brave person symbolizing all of us. We are a little too squeamish to let people see our feet, or God forbid, SMELL our feet, or, as Jesus did, wash our feet. Maybe that is something we need to consider. Maybe we need to find ways to take off our shoes, to expose all ourselves, to be awed by the God who shows up as fire that doesn’t burn, to know that we stand on holy ground, not just at Horeb, not just in church or other sacred spaces, but everywhere we stand, or swim, or fly—for all can be “holy” with God. And maybe we need to hear, again and again and again, the promise “I will be with you”—especially when we are facing new adventures, or things that seem improbable at best. “I will be with you,” as our Bible Study is schooling us, rings through the Bible, like a refrain, a chorus, so even though new verses are added, you can trust that eventually you will loop back to the familiar lead-in and you can begin to sing the tune you already knew, the bedrock of the whole song. Maybe the writer of the gospel of Luke knew that those schooled in their Scriptures would immediately remember Exodus whenever FIRE was mentioned. Maybe especially when the community was looking for a new man of God, a new one to lead them out of a different captivity, enslavement to the Roman Empire. Fire might have connotations of hard work and terror, of difficult years wandering in the wilderness, of leaving the land they knew to follow God. The promise “I will be with you” asks a lot of the ones standing on holy ground. But fire isn’t the only ancient symbol lifted up in this passage. There is also DOVE. The Holy Spirit descending like a dove. Now I’m pretty sure we would have a totally different vision of Holy Spirit if we said it descended like an eagle, or a crow, or a blue bird, or a chickadee. We all have the idea that this dove was a peaceful, gliding bird. That is what we have made of doves. The symbol of Shalom, which gets pasteurized into something sweet and gentle and kind. 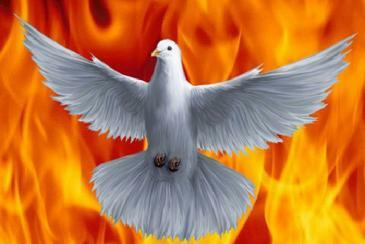 The Hebrew dove would have immediately brought to mind the older story even than the burning bush. It would have gone all the way to Noah. For in that story, as Noah and the only living things left on the earth after the ravages of flood waters were hoping and praying for something other than water to make itself known—Noah sends out a dove, hoping it will find land. Noah sends out the dove a second time and this time it returns with a freshly plucked olive leaf. Noah waits a little while and sends out the dove a third time, and this time the dove did not return. For me, the dove in this story is the promise of new life, of a reboot, of getting a second chance. The more famous image from the Noah story is the bow set in the clouds, the promise that God would not send a flood to destroy creation again. But for those who know the story well, the dove is just as important. It is the dove who is the pioneer, the one flying above the receding waters, the one on the lookout for the return of life, the shoot that would signal that God was still with them, God had blessed the earth again with life, that they were going to be ok.
And this may have been a very important message for those gathered at the Jordan with John. The messages from God had dried up. There had been at least two hundred years since the last prophet’s words to God’s people. Had they messed up so badly that God had left them totally? Was there never to be a way out of the terrible situation they found themselves in right then? They might have felt like they were a lonely boat in the midst of an ocean of immorality, and cruelty, and hatred, and oppression. Was there no end to this? Were they going to die waiting for new land, new life, a new chance to appear? Maybe this was why so many people gathered at the river that day, as they had in days past. So many people desiring at least a personal pivot of circumstances, if not the national one for which they yearned. Whether they got to see the Holy Spirit (as a dove) descend on Jesus, or whether that description was added later, it is clear that this moment was a turning point—like the moment the dove was sent out and didn’t return. It was the beginning of a new world—even if it wasn’t as stark as the ark resting on Ararat. It was the promise once again, contained in this person, this One who John had talked about, and whom the hearers of the gospel of Luke had marveled at his marvelous birth—now grown into adulthood, now ready to pass on to them the baptism of fire and Spirit, of fire and dove. That is where we stand today. We stand on holy ground. We are faced with a God who does unimaginable things—and asks us to go and do the impossible in God’s name. And that is what we are promised. God will be with us. In God there is new life, a new way, and we are called to continually be ready for what may lie in store. God’s Spirit is always hovering over the waters just as creation is going to start again.